Norway Rat (Rattus Norvegicus, Warf rat, Brown Rat): Medium sized, chunky, small/sturdy ears, tail shorter than the body/pink/scaly, Blunt/broad muzzle, good swimmer, prefers ground dwelling, basements, sewers, crawlspaces, under slabs. Roof Rat (Rattus Rattus, Black Rat, Ship Rat): Medium sized, slender, large/creased ears, tail longer than the body/gray, narrow muzzle, agile climber, doesn’t like swimming, prefers attics, rafters, forms runways along pipes, wires, beams. House Mouse (Mus Musculus): small 3-4 inches, 3-4” tail, large ears, long/thin tail as long or longer than body, small triangular head, narrow/sharp muzzle, small feet. Fill entry points larger than ¼” or larger, or pencil width under a door. Keep garbage picked up and stored in tightly sealed containers. Rodents can gnaw through plastic so metal or thick/hard plastics are preferred. Keep stored foods, pet food and lawn/bird seed in plastic or metal containers with tight lids. Clean up dirty dishes and spilled foods right away. Clean BBQ grills and keep area clean. Remove pet bowls immediately after use. Clean up any spilled food and bring in water dishes over night. Remove bird feeders: they attract rodents as well as the scattered seeds that drop on the ground. Keep compost far away from the house. Remove overripe produce from under fruit trees and gardens. Clean up pet feces and seal pet doors at night. Eliminate stored items near buildings. Rodents will burrow under anything left on the ground. 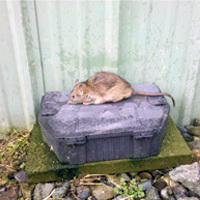 Routine rodent maintenance to keep rodent populations managed. Consider crawlspace cleanouts for bad infestations.